Hollywood legend Van Heflin takes a tour of the scenic United States in this beautifully filmed documentary, a ratings smash when it originally aired on NBC in 1964! Plus 'While The City Sleeps', a noir-tinged episode of Expedition Los Angeles. Hollywood legend Van Heflin takes a tour of the scenic United States in this beautifully filmed documentary, a ratings smash when it originally aired on NBC in 1964! 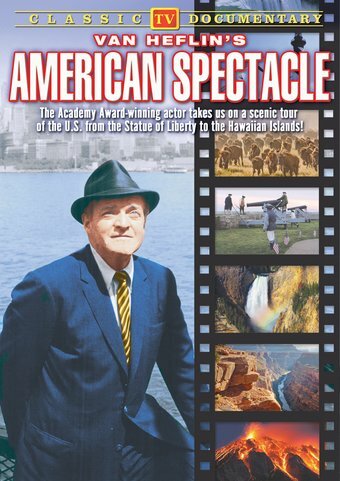 American Spectacle shows us the majesty of locales such as Cape Cod, Niagara Falls, Death Valley, Yellowstone Park, and the Grand Canyon, all described in Heflin's deep, rich baritone. Starting on a ferry on Liberty Island in New York harbor, he visits these locations before reaching his final destination in Hawaii. Director Tom Priestley's moving camera captures the roaring whirlpools of Niagara, the mighty geyser at Old Faithful, the magnificent Knik Glacier of Alaska as it slowly melts, and finally, the awe-inspiring Kilauea volcano in Hawaii, an ever-present danger. The film was made to further the cause of those who wish to preserve these wonders, for as Heflin states, "Paradise lost can never be regained." The rugged leading man is best remembered for his roles in Westerns like Shane (1953), 3:10 to Yuma (1957), and Gunman's Walk (1958). For many years Heflin was the youngest actor to ever win an Oscar, for Johnny Eager (1941). Tom Priestley was later nominated for an Academy Award himself for his groundbreaking documentary The Killing Ground (1979), about the dangers of toxic waste. Writer-producer Lou Hazam worked on pioneering documentaries for NBC and was also an Emmy Award winner. "It's no secret I like way Lou writes; it flows for me," Heflin told TV Magazine in 1964. "(American Spectacle) is an effort to enable TV audiences to see our land as they have not see it before, and to arouse in them a pride in its great, natural beauty." BONUS: Expedition Los Angeles "While The City Sleeps" (1961): Expedition Los Angeles was a short-lived public service TV program airing on KABC in Southern California. This episode, "While The City Sleeps", is an artful, noir-drenched portrait of Los Angeles after the sun goes down. The hardboiled narration, written by political journalist Saul Halpert, pulls no punches. "The night is beauty...as well as ugliness." Among the gamblers, prostitutes, and all-night pharmacies there are moments of true transcendence, like a concert by jazz pianist George Shearing and his band.